Apple iPhone 5 gets record two million pre-orders in 24 hours | What Hi-Fi? Apple has received two million pre-orders for the iPhone 5 in just 24 hours, the company announced today. 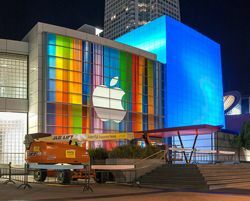 That figure is more than double the record set by the Apple iPhone 4S, making it the biggest ever Apple iPhone launch. Demand has exceeded supply, and Apple has confirmed that not all of the pre-ordered phones will be delivered on the release date, September 21st, with many set to reach customers in October. "iPhone 5 pre-orders have shattered the previous record held by iPhone 4S and the customer response to iPhone 5 has been phenomenal,” said Philip Schiller, Apple’s senior vice president of Worldwide Marketing.